Unlike some of my colleagues in biblical studies, I do not experience miracles. Or at least I don't perceive most things that I witness in my day-to-day experience as God's intervention. I'm usually the guy sitting across the table from Jules, eating filthy pig meat and challenging the claim that God came down from heaven and stopped the bullets. John 12:29 says, "So the crowd of people who stood by and heard it were saying that it had thundered; others were saying, 'An angel has spoken to Him.'" Had I been there, I would have probably heard thunder. I readily acknowledge that the limits of my own perception and my presuppositions color my experience. I'm no authority on what can and cannot happen in the universe. Even so, I am much more inclined to experience God in small things: beauty; unlikely spiritual transformation; a pennant race. But I just don't encounter the supernatural or I don't interpret it as such if I do. This I call my experience of "God's silence" and am convinced that many, many Christians experience this silence more often than not. . . . even if they don't talk about it. This topic is one of the major motivating factors behind my new book: Near Christianity. Today on NPR I learned that Pope Francis will declare Mother Teresa a saint. This short podcast is worth a listen: "How The Catholic Church Documented Mother Teresa's 2 Miracles." This, of course, means that the Church must verify at least two miraculous encounters associated with Teresa. 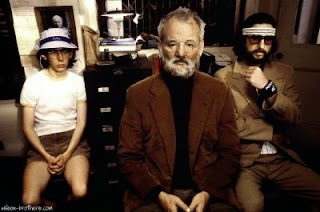 I am not the sort of person that rejects the experience of others out-of-hand as fraud, fiction, or foolishness just because I do not understand it. And so I find this story intellectually fascinating rather than intellectually repulsive. This story is even more fascinating to me because Teresa's journals reveal that she (for almost 50 years) experienced God's silence. [James] Martin, editor of the Jesuit magazine America, notes that in a posthumously published collection of her private journals and letters, Mother Teresa: Come Be My Light, the nun so widely revered for her spiritual purity acknowledged that she did not personally feel God's presence. "In my soul I feel just that terrible pain of loss," . . . . Martin says Mother Teresa dealt with such pain by telling God, "Even though I don't feel you, I believe in you." The NPR story then goes on to describe Teresa's sense of numbness as "doubt." But I think that we ought to differentiate a lack of feeling of God's presence (what I am calling "silence") from doubt. The two can be related. I imagine that doubt can lead to a lack of experience and vice versa. But God's silence and doubt of God are not the same in my experience. I talk more about this in the book, but allow me to make three points. (1) I used to think that my experience of God's silence was a deficit in me, as if I required fixing. I now see this as a valuable difference among people of faith—one that contributes to a necessary diversity. (2) We do Teresa a disservice in collapsing doubt and God's silence into a single "problem." I see St. Teresa as an exemplar of faith. She is someone who could experience (even if uncomfortably) God's silence for 50 years and remain faithful to her mission. (3) What a tragedy that Teresa had to keep her experience of God a secret for all of those years. Surely there is a place for God's silence in the Psalms. Even Jesus experienced God's silence. Why are Christians so reluctant to discuss this openly? 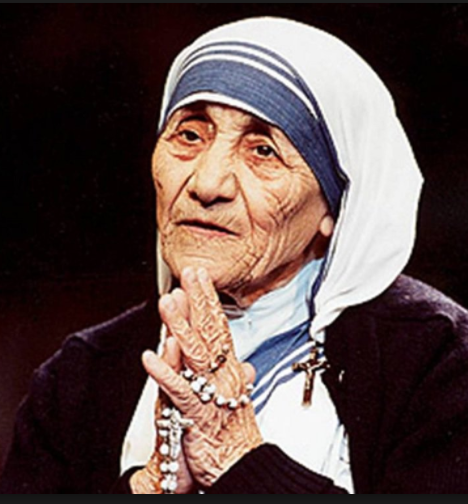 What a loss to others who might have benefited from Teresa's witness. I admire the Jules Winnfields of the world—folks who encounter the Divine differently than I do. Who am I to begrudge such a transformational and powerful experience? But I also admire saints who remain faithful because there is something bigger at stake than one's own experience. Near Christianity: How Journeys along Jewish-Christian Borders Saved My Faith in God. 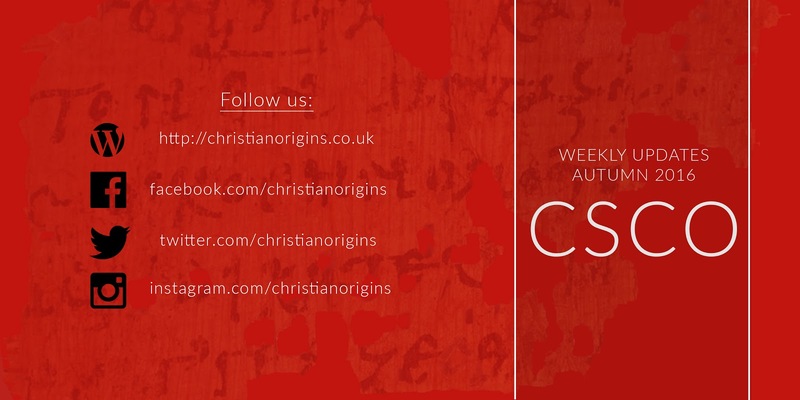 The Centre for the Study of Christian Origins over at my alma mater, the University of Edinburgh, has sent the following two flyers to us and we're happy to share them. CSCO will be sharing content this Autumn on social media and invites any former or current students to contribute, and invites everyone else to stop by their website (www.christianorigins.co.uk) to check in with them. I've begun working on my paper for the John, Jesus, and History meeting at this year's SBL Annual Meeting in San Antonio. My paper is called "What is History? Reading the Gospel of John as a Historical Text" and will apply discussions of memory and media to refine what we mean when we look for the historical Jesus in the Fourth Gospel. I'm a newbie to the world of Johannine scholarship, so I'm looking forward to learning a lot about this obscure (to me) section of the canon. 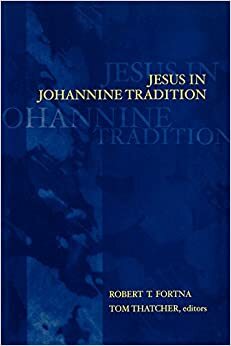 As I start writing, I'm working through many of the essays published in Robert Fortna and Tom Thatcher's edited volume, Jesus in Johannine Tradition (Westminster John Knox, 2001). Arthur Dewey's essay, "The Eyewitness of History: Visionary Consciousness in the Fourth Gospel" (pp. 59–70) is causing some problems for me, and I thought I'd throw those up on this particular wall and see if anyone here has any comment. But he and I draw strikingly different conclusions from his insight on the more complex notion of eyewitness in FG. I use this as a limiting principle that excludes some witness to Jesus' actual life and teachings. That is, some people witnessed the events of Jesus' life but were not eyewitnesses because they were not empowered by the Spirit to offer proper testimony to those events. Dewey, on the other hand, uses this insight as an enabling principle that broadens the scope of Jesus' eyewitnesses to include everyone empowered by the Spirit, whether or not they actually witnessed Jesus' actual life and teachings. In theory, the status of eyewitness—in this proposed Johannine sense—is still open today; it certainly was at the end of the first century CE. As I see it, the Johannine author stressed rather than marginalized the physical senses in his view of eyewitness-hood. "And the Word became flesh and took up his dwelling among us, and we have seen his glory" (John 1:14). "That which was from the beginning, which we have heard, which we have seen with our eyes, with we have beheld and our hands have touched concerning the word of life" (1 John 1:1; see vv. 1–4). Moreover, he strongly differentiates those who have actually seen from those who haven't, and he portrays Jesus pronouncing blessing over those who have faith despite not having actually been an eyewitness to Jesus' resurrection: "Have you come to believe because you have seen me? Blessed are those who have not seen and nevertheless believe" (John 20:29). Finally, the strong affirmation of FG's link with eyewitness testimony in John 21 makes a comparable distinction: "This is the disciple who testifies about these things and who has written them. And we know that his testimony is true" (John 21:24). The editor/redactor responsible for John 21 does not include himself among those who are offering testimony; the status of "eyewitness" is closed to him because he has not seen, he has not heard, he has not touched the things which are recounted in FG. Those of you more familiar than I am with the stream of Johannine scholarship: What would you say about these things? And those of you who are more interested in John's Gospel than I am (whatever your scholarly credentials): What say ye? 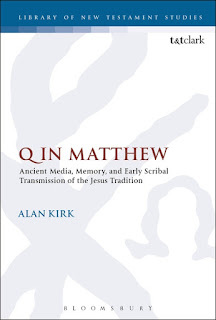 Last week I mentioned the publication of Alan Kirk's major new study on Q from the perspective of ancient media studies, Q in Matthew: Ancient Media, Memory, and Early Scribal Transmission of the Jesus Tradition. 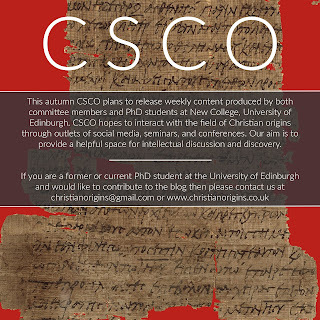 Today the Jesus Blog is very happy to bring readers a guest post from Prof Kirk offering an overview of this exciting new book. 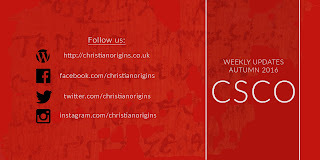 Chris has offered me a guest blog spot to say a few things about the book, and I’m happy to take him up on the offer. Chris’s blurb actually does a very good job of summing up its essential objectives. I started to write the book (back in 2004!) as an analysis of how defective, binary conceptions of orality and writing have affected scholarly hypothesizing about Synoptic relations down the whole history of Synoptic Problem research to the present – with a concluding chapter featuring an example or two illustrating the potential of a media interface model for clearing up some of the source-critical difficulties. But as it turned out, what was to be the “concluding chapter” took on a life of its own and morphed into a full-fledged analysis of the 2DH in the ancient media framework – more specifically the pesky problem (for the 2DH) of Matthew’s Q utilization. In the interim I had done work on the memory/tradition problem, and came to see that it was impossible to separate ancient media realities, memory, and compositional practices from each other – and hence from Synoptic source-critical questions. This altered the overall conception of the book, and ironically I ended up cutting out most of the material I’d worked up on media conceptions across the history of Synoptic scholarship. How does memory come into the picture? As Chris hinted, I’ve always tended to see the primary importance of cultural and cognitive memory theory as lying in what it tells us about the origins and history of the Jesus tradition and the Gospel literature – in fact that it can become the basis for a new history of the tradition – and I’ve always found it lamentable that it has come to be connected in people’s minds primarily with historical Jesus research, or to be more specific, with claims and counter-claims about the historical reliability of the tradition. It certainly has obvious applications in HJ research – but HJ historiographies that appeal to memory theory naturally must be grounded in a solid theoretical understanding of how the tradition mediates that past – which is what cultural and cognitive memory theory can deliver. The bridge between memory-grounded analyses of the history of the tradition and HJ historiography, I think, is Wirkungsgeschichte (reception-history) approaches. But this book is not a piece of HJ research; what it does is bring memory approaches together with research on ancient media and literate practices, analyzing the intersection of these vectors in the scribal, scholarly setting, to address classic problems in the cultivation and transmission of the Synoptic tradition. The Synoptic Problem is the obvious place to try to give these media/memory approaches to the history of the tradition some empirical traction, and to convince our colleagues who are rightly skeptical about the exaggerated claims that are often made for new-fangled approaches that insights into ancient media and memory practices are very relevant to the great questions that have defined Synoptic scholarship. Robert Derrenbacker’s pathbreaking Ancient CompositionalPractices and the Synoptic Problem is an important precedent here. This book differs from Derrenbacker’s in its concentration on the media question, its interest in scribal and scholarly settings and source-utilization practices (in addition to the practices of the GR historians that Derrenbacker looks at), and its interest in ancient memory practices, especially the key role these memory practices played in the cultivation and utilization of manuscript tradition. The second part of the book works up a specific proposal that draws upon the source-utilization practices of ancient scribes and scholars to clarify Matthew’s Q utilization in the framework of the 2DH. Taylor’s “multiple scans” solution is hopelessly inadequate, and it is certainly difficult to defend it given what we know know about ancient media realities and compositional practices. I won’t give any spoilers here about the specifics of the argument, since I think readers interested in this problem should evaluate it in the context of the entire analysis. And naturally, I don’t miss the opportunities this line of analysis offers for critique of the experiments in ancient media analysis that our FGH friends have occasionally mounted in defense of their views. And maybe to convert skeptics, holdouts, and fence-sitters like Chris Keith and Rafael Rodríguez to the truth of the 2DH! Many thanks to Katya, Stan, Nathan, Trinity and the whole Zondervan team for investing in this project. It is an (admittedly) unusual book and thus risky for a publisher to take on. For an early review, check out Sarah Mayo Heroman's blog, Earth's Crammed with Heaven. 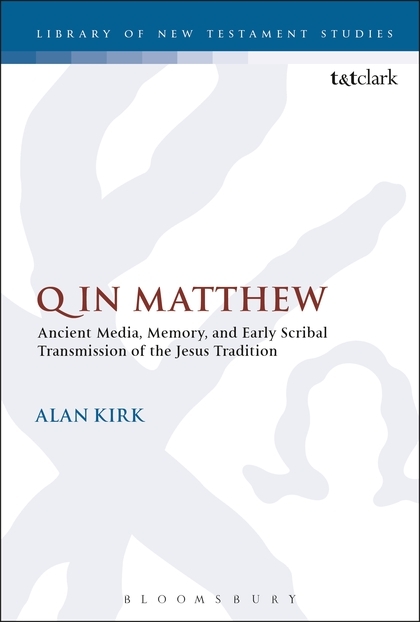 Readers of this blog may be interested to know that Alan Kirk's Q in Matthew: Ancient Media, Memory, and Early Scribal Transmission of the Jesus Tradition is now available from the Library of New Testament Studies monograph series at Bloomsbury T&T Clark. This study is a defense of the Two-Document Hypothesis to the Synoptic Problem, and thus a major (350 pages) contribution to Synoptic Problem and Gospels research. But the volume is much more than that. 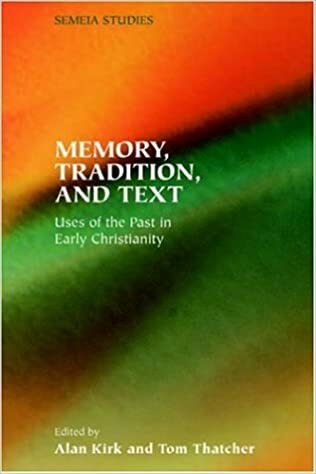 It defends the Two-Document Hypothesis by bringing studies of ancient media and memory to bear upon the issue, and is thus probably the most sustained application of the "memory approach" to an issue outside historical Jesus research in NT studies. Several of us are big Alan Kirk fans, and we have been waiting for this book for several years now. This promises to be a substantial contribution to the field, which will inspire debate and reconsideration. Alan is particularly determined in this book to show that "memory" research is not simply theory-for-the-sake-of-theory, but that it allows us to get, in his words, "new leverage" on traditional problems in the field. If any readers here are interested in current approaches to Gospels research based on orality/textuality, literacy, ancient book culture, and collective and cultural memory, this book sets the cutting edge of the discussion. As the editor of the monograph series, I'm particularly happy to have it in LNTS and congratulate Alan on this major accomplishment. §5: a summary discussion of the evangelist's distinctive hermeneutic. The first chapter, entitled "The Gospel of Mark: Herald of Mystery," filters the shortest Gospel through these five sections. The first section ("'Take Heed What You Hear': Mark as Interpreter of Scripture") is less than one page long, which I find unfortunate. Even in this too-short discussion, however, Hays makes a critical point: Mark, who "rarely points explicitly to correspondences between Israel's Scripture and the story of Jesus" (p. 15), nevertheless exhibits a "deft but allusive use of Scripture" that "repeatedly gesture[s] toward wider contexts and implications that remain not quite overtly stated" (p. 16). This claim will be fleshed out in the ensuing discussion. The second section, "Apocalyptic Judgment and Expectancy: Israel's Story in Mark's Narrative," provides significantly more substance. Hays explores Mark's portrayal of Israel's story according to "four narrative strands": "inbreaking judgment, eschatological restoration, the strange continuing resistance of Israel, and the shocking death of God's son" (p. 20). This section provides discussion of the first three of these narrative strands; the fourth is taken up in the next section (see below). Hays offers a robust discussion of the judgment of God against Israel's idolatry and unfaithfulness, inasmuch as "Israel has reached a moment of crisis" and now awaits the promised day of the LORD, which "should be heard not as a word of comfort but as a terrifying word of warning" (pp. 16, 18–19). The theme of judgment continues beyond the scriptural themes surrounding the introduction of the Baptist in Mark 1 and includes Jesus' ministry, especially in the prophetic action against the Temple in Mark 11 (pp. 26–29). This discussion, which continues on from earlier works (see, e.g., Watts, Marcus), is a marked improvement from remarks one still encounters from time to time that John came preaching the judgment of God but Jesus brought grace and forgiveness. Rather than disjoining God's judgment against ungodliness and injustice from the promise of restoration for his people, Hays keeps these two ideas intertwined: "the threat of judgment and destruction can never be sounded apart from the more fundamental promise of God's ultimate design to bring about Israel's deliverance and restoration" (p. 29). This, I think, exactly captures the textual dynamics in Mark (if not also the other Gospels) and his reading of the scriptural texts. The apocalyptic restoration of Israel resonates across multiples features of Mark's Gospel, from the Isaianic context of euangelion to the appointment of twelve disciples to Jesus' healing of the deaf and blind and others, all of which Hays reads in light of Mark 1.1–3, which "serve[s] as a sufficient indicator for the attentive reader" that God is restoring his people in and through Jesus' words and actions (pp. 32–33). However, despite Mark's portrayal of Jesus' ministry as one of fulfillment of prophetic promises, Hays describes Mark as "the most reticent about claims of fulfillment," which Hays uses to explain Mark's "remarkable decision not to narrate any resurrection appearances of Jesus" (33). The reader, just as the disciples at the end of Mark 13, are left in a fundamental posture of waiting and expectation. Finally, Hays discusses "the strange continuing resistance of Israel" in Mark in two passages: the parabolic theory in Mark 4.11–12 and the parable of the wicked tenants in Mark 12.1–12. Hays's discussion of Mark 3–4 // Isaiah 5–6 helpfully draws out parallel movements between the two texts, though his discussion of "the beloved son" in Mark 12 misses, I think, a striking implication of Jesus' parable. Given the heavy presence of "Israel" in the parable and its evocation of the Isaianic song of the vineyard in Isaiah 5, the significance of Jesus as God's "beloved son" can only be grasped in light of Israel's election to sonship. For example, God sends Moses to Pharaoh to send out "my first-born son, Israel" in Exod. 4.22, and of course Pharaoh refuses. In the parable, the Temple authorities, who are questioning Jesus about his authority, find themselves on the verge of becoming like Pharaoh, opposing the redemptive movement of God (see also Mark 3:22–30), and imminently to be the objects of God's wrath. This reading, I think, strengthens rather than undermines Hays's approach to Israel's resistance to Jesus. I am completely sympathetic to this reading of Mark's resonance with Scripture; it would be peculiar even in Mark's account of the death of the son of God if Mark, after the three-fold prediction of Jesus' passion and resurrection (see Holly Carey, Jesus' Cry from the Cross, LNTS 398 [T&T Clark, 2009]), recounted Jesus' use of Psalm 22's first verse and didn't intend his readers to recall the psalmist's ultimate confidence in God's abiding presence. This section, 40+ pages in length, provides much that is helpful for thinking about Mark's use of Scripture in its portrayal of Jesus. Even so, there are weaknesses. For example, Hays presses his otherwise interesting discussion of the allusion to Job 9.8 LXX ("who alone stretched out heaven and walks upon the sea as upon dry ground") in Mark's account of Jesus walking on the sea in 6:45–52. Job 9 also uses the verb "pass by" (παρελθεῖν) in its praise of the One who walks upon the sea (see Job 9.11), which Hays links to the strange detail recounted in Mark 6:48: "Jesus comes to them [the disciples], walking upon the sea, and he wanted to pass them by" (ἤθελεν παρελθεῖν αὐτούς). So far so good. But then goes on: "To these observations should be added the insight that the verb παρελθεῖν almost surely alludes to Exodus 33:17–23 and 34:6, where God is said to 'pass by' Moses in order to reveal his glory indirectly" (72). This, however, seems an allusion plucked out of thin air, based on a single word—παρελθεῖν, "to pass by"—that occurs well over 100 times in the LXX and whose details do not fit the Markan text (except inasmuch as Hays wants to find Mark portraying Jesus as the God of Israel): Moses asks to see God; the disciples ask nothing of Jesus. Moses is bold in his request; the disciples cry out in terror. God places Moses in the cleft of a rock; the disciples are in a boat on the sea in a storm. While many (perhaps even most) of the allusions Hays identifies and explains are compelling or at least plausible, more than once he extends himself too far and imagines echoes where, to my ear at least, there is only silence. Before we move on from §3, we should acknowledge that many readers will have problems with Hays's discussion of "Jesus as the God of Israel?" (pp. 61–78). The analysis in this section often rightly identifies places where Mark blurs the distinction between Jesus and the God of Israel, for example in the way Mark narrates Jesus coming on the "way of the Lord" that John prepared in the wilderness, or in the disciples' dismay that Jesus commands the wind and the waves and they obey. Hays is also careful to acknowledge that Mark also makes distinctions between Jesus and God (see pp. 76–78). Even so, as I read this section I could not help but think that Hays was betraying something of his original intention (to pay "particular attention to the ways in which the four Evangelists reread Israel's Scripture" [p. 7; original in italics]) and reading the Gospels through the lens of later Christological developments. 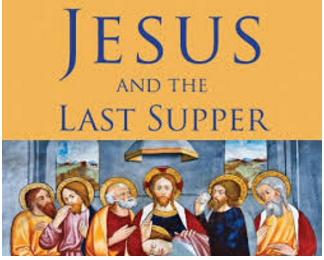 To be sure, Hays draws a connection between Mark's reading of Scripture and later Christological reflection: "Mark's story already poses the riddles that the church's theologians later sought to solve in the christological controversies of the fourth and fifth centuries" (78). All of this leaves me with the uneasy feeling that Hays is bent on justifying later orthodox Christological decisions via a reading of the Gospels. For example, his discussion of Mark 2.7 ("Who can forgive sins but God alone? "; pp. 64–66) jumps to the conclusion that Mark portrays Jesus as the embodiment of Israel's God without ever mentioning that God forgives the sins of the people through the temple cult in Jerusalem and its priestly personnel. If the traditional significance of the conflict between Jesus and the scribes centers on the means of atonement and forgiveness rather than on the identity of Jesus, Hays's discussion will have silenced Mark's echoic use of Scripture in this passage. The fourth section, "Watchful Endurance: The Church's Suffering in Mark's Narrative," is much shorter, which again makes sense since Mark's focus is never on the community of Jesus' followers. Even so, this section struck me as unfocused; very little of these pages (87–97) focused specifically on the Church or Jesus' followers. Hays begins by tracing Mark's use of Scripture to frame Jesus' followers' experience of suffering and persecution, focusing especially on the allusions to Daniel in Mark 13. Strangely, he reads "councils and synagogues" in 13.9 as alluding to Jewish opposition and "governors and kings" [ἡγεμόνων καὶ βασιλέων] in terms of gentile opposition (p. 89), though in Judea and Galilee I'm not sure which gentile rulers had these titles (Pilate isn't referred to by title in Mark, and the only figures called "king" in Mark are Herod Antipas and Jesus, both ironically). Other than Hays's discussion of Jesus' persecuted followers, he discusses [Jesus'] "challenge to Caesar" and "the gospel for all nations." The first of these is relevant to this section only in the last paragraph, where Hays tacks on a reference to "the church's self-understanding as a community set apart from business as usual, a community that owes ultimate obedience to God, while rendering only the most provisional acknowledgement of Caesar's temporary grasp on power" (p. 94). This, I think, is not much of an advance on what we could have said about "the church" without paying attention to the echoes of Scripture in Mark. The second of these ("the gospel for all nations") is a little better, though it still has its problems. First, while Hays mentions relevant passages (Mark 11.17; 13.10; 7.24–30, 31–37 [too briefly], and 15.39), his discussion of most of these is too short to be helpful. Second, he never mentions the first possible allusion to the inclusion of gentiles in this section: the story of the Gerasene demoniac in Mark 5.1–20 (though see p. 93). Third, he strangely entertains the possibility that Mark's πᾶσιν τοῖς ἔθνησιν in Mark 11.17 may have appeared "anachronistic on the lips of the pre-Easter Jesus," even though these are words found in Isa 56.7! (p. 95; see also p. 389 n.150). Unfortunately, these weaknesses overpower any strengths in this ten-page section, and as a result Hays's discussion of the community of Jesus' followers—whether in Mark's narrative or in Mark's social context—is anemic and heft-less. The fifth and final section, "'Hidden in Order to be Revealed': Mark's Scriptural Hermeneutics" (pp. 97–103) brings Chapter 1 to a close. Hays describes Mark's Scriptural hermeneutic as an allusive language through which Mark is able to disclose Jesus despite the inadequacy of human language. All of this is fine as far as theological reflection goes. I would hesitate, however, to seriously entertain the notion that Mark thinks about his approach to or reading of Scripture in quite the way Hays does. (This is not to demean either author's reading of Scripture; it is only to differentiate what I think are two rather different hermeneutics.) For Hays, Mark pushes his readers to become competent readers of Israel's Scriptures: "Mark for the most part works his narrative magic through hints and allusions, giving just enough clues to tease the reader into further exploration and reflection" (p. 98). I'm not so sure. I don't see in Mark any real prods to push his audiences to search the Scriptures, unless "let those who have ears hear" and/or "let the reader understand" are such prods. Rather than pushing Mark's audience to re/read the Scriptures again, I think Mark's use of Scripture reveals something about his envisioned audience. (Here is my response to Danny Yencich's question to my original post: "If Hays had interacted more with Foley, where do you think it would have led him?") Mark's written Gospel employs an idiomatic use of Scripture (so far, I am agreeing with Hays); that is, Scripture provides the language and imagery in which Mark perceives, interprets, and responds to events in his world. That he uses that language without taking the time to unpack its dense (Foley would say "metonymic") referentiality suggests that he imagines himself communicating with audiences who also speak the language of Scripture. Rather than pushing his audience to a deeper understanding of Israel's sacred traditions, Mark is taking advantage of their understanding, leading them as they ask appropriate questions of their Scriptures (e.g., Who is this that the wind and the sea obey him? or, What must I do to inherit eternal life?) and pursue appropriate answers (Truly this man was the son of God). The language of Scripture is part of how Mark continues the "tradition of reception" of the Jesus tradition among his readers as he translates the stories he tells about Jesus from one set of media (oral preaching, oral teaching, informal storytelling, etc.) into a new medium (written narrative). The uninitiated reader may be perfectly able to follow the surface-level narrative of Mark's Gospel without any real problem. But s/he will lack the requisite "ears to hear" the resonating echoes of Scripture that Mark expects will lead his readers as they fill in the inevitable gaps in the story. None of these criticisms should mask my appreciation for what Hays has accomplished in this rather lengthy chapter. And we should probably add another criticism: as Chris Keith has already mentioned, "the main text is full of ideas but the footnotes are light." Yes. But, again, the main text is full of ideas. Hays's discussion of the echoes of Scripture in Mark's Gospel joins an already star-studded cast of voices (Rikki Watts, Joel Marcus, Thomas Hatina, et al.) who have explored this territory. Readers familiar with these other voices will find Hays's discussion a worthy addition to this cast. Newer readers unfamiliar with them will find Hays's discussion a helpful point of entry into an ongoing and vibrant discussion. From the 1970s to early 2000s Jesus’ Jewishness was reconsidered, foregrounded, marginalized, and accepted as consensus. Factors contributing to this line of questioning included (a) an effort to rethink New Testament studies in light of the catastrophic consequences of Christian anti-Semitism, (b) the publication of the Dead Sea Scrolls, and (c) a reaction to the rigid distinction between Second Temple Judaism and Hellenism of previous generations. Jewish voices like David Flusser, Geza Vermes, and Amy-Jill Levine were finally normalized within a field dominated by Christian and post-Christian scholarship. Other mainstream voices like Dale C. Allison Jr., John P. Meier, E. P. Sanders, and N. Thomas Wright accepted Jesus’ Jewishness as a primary starting point for the study of his life. Moreover, this generation reached a consensus that Jesus’ Jewishness was central to his identity, aims, and impact (specifically, Jesus’ eschatology was reexamined in light of other texts of Second Temple Judaism). These developments—the consensus and significance of the starting point—were relatively new to the field. Whereas previous generations failed to normalize the views of e.g. Jacob Emden (1697–1776), Abraham Geiger (1810–74) and Joseph Klausner (1874–1958) the “question” of Jesus’ Jewishness was finally a matter of nuance and focus rather than a disputed starting point. Importantly, it rightly became the central focus of Jesus research rather than simply the starting point. The so-called Third Quest, therefore, did not rediscover Jesus the Jew. Rather, this period marginalized a European thread of research that promoted an Aryan or even Christian Jesus. Today Jesus’ Jewishness is no longer presented as a “question” in need of an answer; it is the premise and guiding focus of the Jesus historian. A byproduct of the emphasis on Jesus’ Jewishness was the influx of maximalist readings of the Jesus tradition by scholars who defended the New Testament as largely historically accurate. 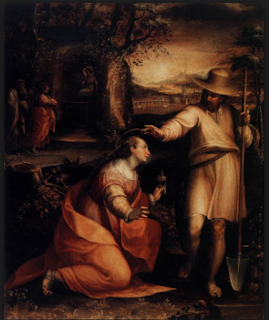 Whereas previous generations mined the gospels for the kernels of Jesus’ originality (elements that set Jesus against his Jewish “background”), many Christian scholars embraced the affinities between Jesus and Judaism. This allowed them to look for and find a Jewish historical Jesus within a largely Jewish New Testament. 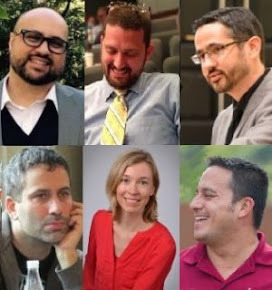 In service to this goal, many of these scholars employed field-specific literary tools. This brings us to the second key characteristic of that generation. From the 1970s to early 2000s a handful of field-specific criteria were regularly employed in Jesus research. Some scholars identified dozens of criteria, some avoided their use entirely. Even so, the criteria of dissimilarity, coherence, Semitic influence, embarrassment, multiple attestation, and multiple forms were staples of the period. These formalized criteria represented the logic of previous generations but took on concretized and popularized form. While many of the adherents of these criteria (myself included) voiced dissatisfaction with a number of these criteria and/or their application, the search for a scientific method often settled for a checklist of criteria. In their most optimal application, the criteria were used to fortify more sophisticated methodologies. This is no longer the case. Whereas the so-called Third Quest generally accepted the use of criteria for authenticating pericopae in isolation, Jesus historians now must defend the use of these criteria. But judging from the last decade of articles and monographs, most historians—John P. Meier being a notable exception—simply avoid them. From the 1970s to early 2000s surveys of Jesus research had standardized a “quests” paradigm in keeping with Albert Schweitzer’s nationalistic and Eurocentric myopia. This paradigm imagined that the phases of Jesus research could be divided into epochs and the genius of “great men” within these epochs. The so-called Third Quest was thus a beneficiary and dissident of the Old Quest, the No Quest years, and the New Quest. Key names of great German scholars (Hermann Samuel Reimarus, Albert Schweitzer, Rudolf Bultmann, Ernst Käsemann) were often offered as heuristic representatives of each era. But rather than distinguishing itself from previous generations, this “quest” language betrays the neo-romantic tendency to aggrandize the originality of men who transcended their social milieux to inaugurate new epochs. So the very tendency meant to distinguish the so-called Third Quest from previous generations reveals the same historiographical drive. Indeed the normalization of Jesus’ Jewishness and the standardization of methodology do not represent original ideas but attempts to build upon the ideas of previous generations. Still the drive to categorize the history of ideas by great men and distinct epochs demanded a construct. The label given to this construct was “Third Quest.” Not only is the moniker suspect, the historiographical drive that led to the moniker is suspect. If indeed the Third Quest (both as a misnomer and as a heuristic construct) has run its course, what now? . . . .
1 I do not include the “Jesus Seminar” of the 1980s and 1990s under the (already dubious) ­label of “Third Quest” as it is clear that Bob Funk refused to allow his brainchild to be associated with it. See Robert W. Funk, “Milestones in the Quest for the Historical Jesus,” The Fourth R 14–4 (2001); https://www.westarinstitute.org/resources/the-fourth-r/milestones-in-the-quest-for-the-historical-jesus/; accessed: May 9, 2016. It should be said, however, that although Funk explicitly aligned his brainchild with previous generations of scholarship, the Jesus Seminar served as the foil (and catalyst) for several contributors to the so-called Third Quest. 2 Masculine language is used here to represent the prejudice of the age from which this ­historiography emerged. As time has allowed, I have been working through Richard Hays's Echoes of Scripture in the Gospels. This book is big and impressive, an application of Hays's general approach to the Pauline epistles in his classic Echoes of Scripture in the Letters of Paul (1989) to the Gospels. Along with a few other works, Hays's work on Scripture in the Pauline epistles set the tone for OT-in-the-NT research on Paul and became the springboard for all subsequent discussions. To this day (i.e., over 25 years later) you can find new PhDs who use his definition of "allusion" or "echo" etc. for the basis of their study. Only time will tell if this new book on the Gospels will have the same kind of impact, but I can say this with confidence (and I try to avoid saying this too often): Any Gospels scholar or student needs to have a copy. The reason that this book is a must-have is that, in any given Gospel unit of tradition where a Hebrew Bible passage is cited, alluded to, or echoed, Hays gives almost every conceivable possible intertext. Thus, this will certainly be for the Gospels the go-to resource for OT-in-the-NT, regardless of whether a given scholar agrees with Hays's own take on any given issue. 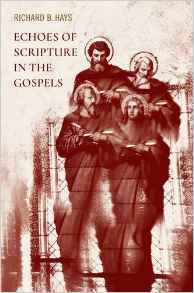 The book has a brief introduction, after which it treats the role of Hebrew Scripture in the Gospels in chapters on Mark, Matthew, Luke, and John, in that order. The comprehensive nature of the discussion is the study's chief virtue. As Rafael has already noted, the introduction also gives the reader an insight into the circumstances under which the book was written, as Hays was in the midst of treatment for pancreatic cancer and a host of scholar-friends and Baylor University Press editors helped him with the editing and footnotes, etc. This information possibly also explains some of the less-than-desirable aspects of the book. For example, at times, the main text is full of ideas but the footnotes are light. On pp. 78, then 83-86, Hays discusses the citation of Psalm 22:1 from the cross in Mark 15:34, a topic about which entire dissertations have been written (here, here). Other than citing himself on a methodological point (85n.133), however, he engages/cites only one scholarly discussion, an essay of Crossan's from 1978 (84n.132). So if you're looking for a full, complete, and up-to-date engagement with secondary sources, this won't always be the book you need. But this is also pretty understandable. If Hays attempted that, the book would be at least twice as big as it is, and it's already 500 pages. Plus, any shortfalls in discussion of secondary sources is more than compensated by discussion of the primary sources, and here Hays shows himself to be a master. I'll note one more thing, which is methodological in nature and I found very interesting. On numerous occasions, Hays raises the possibility of a Hebrew Scripture intertext and claims that astute readers might catch the proposed echo or allusion. These occasions add to the tapestry of Scripture that Hays is weaving, but there is not always an argument actually put forward that there definitely is or is not an allusion here; rather Hays says something to the effect of "those with ears to hear" will catch it, implying that others will not (48-59, 50, 52, 53, 69; cf. 75). In principle, I'm not actually against this and I think the cumulative argument that Hays is making--namely, that the Gospel authors are steeped in Hebrew Scriptures and steep their narratives about Jesus in those same Scriptures--supports it. But as I was reading, I was thinking, "If someone wasn't inclined to think this is an allusion, though [I studied with a scholar once who thought people get really carried away when it comes to spying HB texts lurking behind NT texts], how would he or she ever disprove it? How would you argue against Hays?" That's when I realized the genius of Hays making the argument this way, by which I mean the relationship between his general argument that the authors alluded to and echoed the Hebrew Scriptures and his specific arguments in these instances of allusion or echo. He's only argued that an informed reader, one might say "ideal" reader, would notice the connection that he sees. Of course, this ultimately means a reader who reads the text the way that Hays does, but the interesting point is that he can always easily concede that not every reader or hearer of the text would notice this allusion. So, theoretically, if we were at SBL and someone was feeling cantankerous (no doubt because they'd had to stay until the dreaded Tuesday morning spot to hear this paper and they arrived to the receptions the previous evening after everyone had already depleted the open bars) and responded, "Yes, but in 400 years of subsequent interpretation, not a single church father ever commented on this or noticed this intertext," it wouldn't really matter. The cumulative effect of Hays's argument rolls right on because those readers apparently didn't have "ears to hear." It's a good and right general argument, but Hays only ever needs "someone" "somewhere" to have been capable of noticing what he's proposing in order to incorporate some of these allusions into the argument. I'm pretty impressed at how this type of argument innoculates itself against arguments to the contrary! In Skinner's first part of his serial review, he omitted all of my arguments against historical plausibility (see Jesus and the Last Supper, pp. 45-46) and incorrectly said that I "state" an "intention" to “err on the side of historicity.” I appreciate that he was willing to go back and correct the omission from the original post. However, in his third installment, he still seems to be omitting what I say and critiquing things I did not say. 1. For example, Skinner claims that I “never” provide “any sort of statement about what the gospels are (in terms of genre)” or “how they function as historical (or even quasi-historical) documents.” This is demonstrably false. On page 46, I expressly state: “the four Gospels should not be treated as stenographs of Jesus’ teachings but as ancient Greco-Roman biographies.” Then I spend several pages discussing the implications of this for what I mean by historical plausibility (pp. 46-50). Why ignore this and then critique me for “never” giving any statement about genre? 2. He also claims that the list of “new Moses” parallels he quotes at length (from pp. 54-55) are texts that I “deem historically plausible.” This is also incorrect. In fact, in the very next line—which Skinner strangely omits—I deliberately left the question of their historical plausibility open: “Whether or not one accepts the historicity of each one of these episodes…” (p. 55). In reality, I made no judgments about historical value of any of these passages. I simply listed them to show what evidence has led other scholars, such as Dale Allison, to conclude that Jesus saw himself as a new Moses. Why leave out this line? 3. Skinner states that I appear to “reject” the classic “Three Stage” model of gospel formation. I almost laughed out loud when I read this, since I regularly teach Vatican II’s three-stage model of gospel development in Dei Verbum 19 to my graduate students. Though somewhat overly simplistic, this model helps show that the gospel authors selected some things from tradition, reduced some things to a synthesis, explained some things in view of the contemporary situation of their churches, etc. As a result, Skinner is right: the gospels are certainly not “raw, unadorned, historical ‘reporting’.” But I never said they were, nor did I treat them as such. Those are his words, not mine. I said they were ancient Greco-Roman biographies. And I explicitly stated that “the ipsissima verba” are “incontrovertibly not what the Gospel authors... ever intended to provide us" (p. 46). So why focus a critique on positions I did not actually espouse? Why set up a straw man? 4. Finally, there is Skinner's concern over treating the gospels “as though they are records of what actually happened." (Update: in my original post, I misquoted Skinner and used the word 'contain' records rather than 'are' records. I've edited this post to more accurately reflect his point.) As I understand it, the entire quest is predicated on the assumption that at least some of what is recorded in the gospels and other sources "actually happened." Didn't the crucifixion of Jesus actually happen? Aren't Lucian’s Life of Demonax and Josephus’ Life of himself records of things that “actually happened’? I for one think they are. To be sure, that is not to say the gospels or any other ancient biographies are "uninterpreted" accounts--there are no such things. 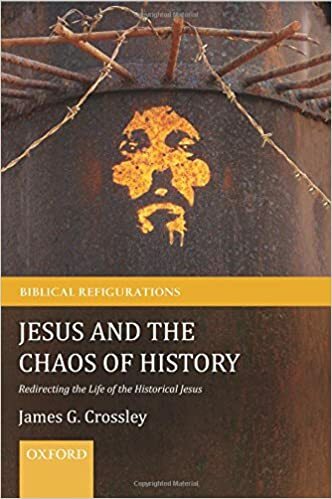 Nevertheless, it is the task of the historian to try to the best of his or her ability to evaluate the historical plausibility or implausibility of a given teaching or action attributed to Jesus in the gospels. And this can't be done simply by appealing to global statements about "the gospels" as a whole, as Skinner seems wont to do. Each saying or action attributed to Jesus has to be evaluated on a case-by-case basis. That is how I proceed in Jesus and the Last Supper. The question is: if a scholar accepts the historical plausibility of some episodes and rejects the historical plausibility of others, the question is: What are the reasons for doing so? To his credit, Prof. Skinner say that he doesn't “want to be guilty of putting words” in my “mouth” or “characterizing my work unfairly.” I appreciate that. But so far, when it comes to several of his main criticisms, that is exactly what he seems to be doing. I hope that in the future he will reserve more of his critiques for arguments that I actually make and positions I actually take. Does Mark 16:9-20 represent a later addition to the Gospel? 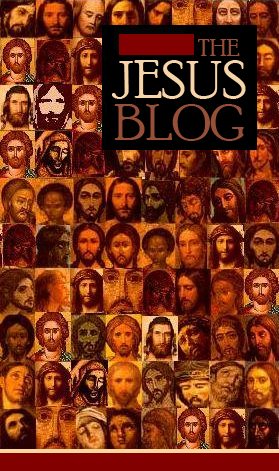 As an almost scientific sociological experiment, we are polling the Jesus Blog community to learn a bit more about you. Feel free to register your vote above and comment below this post to explain your thoughts, hopes, and dreams. This ending indicates that Jesus has been raised from the dead but does not portray Jesus himself—walking, talking, eating, breathing—as such. Later interpreters, it seems, added a few more paragraphs to the conclusion so to portray the resurrected Jesus. Most modern Bibles will include this detail in a footnote before moving onto verses 9-20. In this extended section, Jesus appears to Mary Magdalene, Peter, to two other disciples, commissions the disciples, and ascends to heaven. But even without these extra paragraphs, Mark’s story does indeed convey Jesus’ resurrection. This message is conveyed through the voice of a “young man” who looks as one might expect an angel to look. My point: even if read without Jesus’ appearances, the story ends with a heavenly assurance of the risen Jesus. So why embellish it? My best and only guess is that Mark was extended for apologetic purposes. Here is the logic: if the news of a risen Jesus will elicit belief, how much more so will a portrayal of a walking, talking Jesus elicit belief? The fact that Jesus is no longer among the dead is good news. But the fact that Jesus has no interest in eating your brains is even better news! Mark's editors don't want to end with the women's horror. These editors want to end with a fully restored Jesus. I.e. Mark's editors embellish for the same reason that the Fourth Gospel does: "so that you may believe." But the enlightened mind is a suspicious mind. 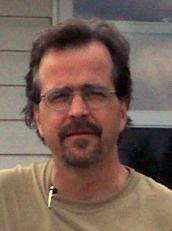 Moreover the enlightened mind is not the sort of mind that Mark's editors have in mind. When we see an embellished ending, we lend less trust to the editor, not more. So the paragraphs meant to elicit belief end up doing the opposite. Such is the case for most of my students who encounter Mark's final footnote for the first time. Not only has Mark's extended ending outlived its purpose, it can and does have the opposite-than-intended effect. Allow me to conclude with a suggestion: why don't we move all of Mark 16:9-20 to a footnote? This would better serve both the scholar and the believer. It would be a more honest rendering of Mark's first-century composition—which is what most seminarians want anyway in a translation. Special Thanks to Leonard Greenspoon!